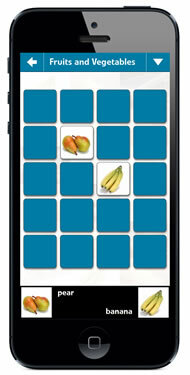 The popular vocabulary learning game of the Easy Learning language courses now available for smartphones and tablets. A simple and effective Play-and-Learn Method of practising vocabulary. Easy Memo is a vocabulary learning game with fun and variety. As you search for pairs of words, you hear and see the words so often that they get anchored in your long-term memory. The connection of picture, sound, spelling and translation ensures a lasting learning effect. Play and learn English words and train your memory at the same time. Easy Memo happens to be lots of fun for kids and a great opportunity for early learners! Easy Memo is stand-alone version of the popular vocabulary learning game of the Easy Learning language courses from STROKES International, a language publisher with 20 years experience in e-learning. Picture, sound, spelling and translation always come up simultaneously, so that you grasp the meaning of the words with all your senses. This ensures that the words will be well anchored in your mind and you achieve a lasting learning effect. Easy Memo is a vocabulary learning game that trains your memory at the same time. Learn about the complete Easy Learning language courses from STROKES International on our website.